Previous postIf X Happens...The Answer is ALWAYS Y....Not So Fast Watson! You know that little hole in the lid of the coffee cup? I believe it might be the worst invention in the history of coffee. Sure… it seems like a good idea… IF (and that’s a big IF) it’s connected properly to the cup. I guess it could prevent spills and such. But one thing I’ve learned over the years is that it could do more harm than good. You never REALLY have any way of knowing what the temperature of the coffee inside might be! It could be too cold. it might feel like you’re actually licking the surface of the sun! I can’t count the number of times I’ve scalded the taste buds off the tip of my tongue trying to sip my coffee out of that dastardly little opening. The problem is that the plastic around the hole insulates you from any sensation that could have given you information about the temperature of the contents within. You’re left with only one option – gradually tip the cup to the point of no return, and just before the fluid meets you mouth, brace yourself for the consequences. So…What Does This Have To Do With Baseball? With baseball players, you can’t see everything going on inside the athlete’s body or his mind, you can never be sure what effect a given training stimulus will have. A cue or an intervention that works on one guy may not have the same effect on the next one. In fact, it could actually make him worse, scarring the tip off his performance for weeks… or it could burn his face off completely. That’s because the training athlete’s body is a dynamic system and in this system, every variable matters. The behavior of every component of the system is dependent on the status and behavior of every other part. The system is highly adaptable, highly variable… and highly unpredictable. Remember, the Dynamic Systems Theory is a mathematical equation used to describe the behavior of economies, ecological systems, politics and other complex entities, and it applies to the training athlete as well. There is no way any one could have structured a plan that could account for the infinite number of unintended consequences that might arise from such an intervention. So…let’s say you have a player who is looking to gain velocity, and you decide he is a great candidate for a weighted ball program. You roll out the same weighted ball program you’ve used on thousands of guys before. It has worked wonders on some guys, adding significant velocity and improving their arm health. You have no reason to expect a different response from this guy. But in the complexity and chaos that is the dynamic system of the training athlete, you can’t always predict how an individual player is going to respond to a given stimulus. or he might blow out. Any of an infinite number of variables – some seen, some unseen – could combine to affect him in either direction. So if you can’t be certain how each athlete will respond to a training stimulus, what should a baseball coach do? That, my friends is the proverbial million-dollar question. What Should Coaches Do Before Designing Individualized Baseball Training Programs? First, abandon the myopic one-size-fits-all approach to training that pervades out industry. You’ll never be able to develop a program that works for EVERYONE. The fact that something worked on someone you coached in the past, doesn’t mean it will work on the guy right in front of you. You MUST assess each athlete and design individualized training programs for each player that cover the entire spectrum of each player’s training experience. That assessment should include, as a minimum, a head- to-toe physical assessment, a video analysis of his movement patterns, a pain audit, a performance audit, a recovery audit, a training history, a body composition and nutritional assessment, and a mental game audit. Only then can you use baseball training camps and programs to forge a path forward for that helps your athletes achieve their goals. The assessment will provide the template for customized training programs, but even then you can’t just “set it and forget it”. You don’t put your car on cruise control and let go of the wheel, and you shouldn’t take that approach when training an athlete. And you shouldn’t bust in with guns blazing either. I see it all the time in most baseball training camps and teams. A coach or an instructor decides within the first five minutes “exactly” what an athlete’s problems are and immediately starts making wholesale changes. Some simply have a guy start slinging around weighted balls and throwing max effort radar gun missiles on the first day in hopes that, under the umbrella of “intent-based training”, the player’s body will organize itself to accomplish his goal. Sure, the athlete’s body, left to it’s own devices, will organize itself, but it won’t always choose the safest or the most efficient organization. As usual, the one-size-fits all baseball training programs fit none. That includes not only the training modality chosen, but also the dose or pace at which it is administered. A velo push day for a seasoned 22 year old vet who has been to our baseball training camps and sessions for 5 years looks a lot different than a velo push day for a 14 year old who is just getting started. Just like when you’re sipping from the coffee cup. You have to ease into it. Start to gradually reassess, and see how its going. 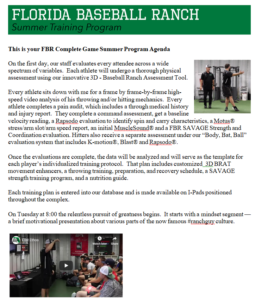 Modulate your baseball training programs’ plans based on the response and performance of each athletes. Build a relationship and communicate with the athlete about what he is feeling. Design a process to give you a starting point based on the results of his assessment, but be willing to veer off of that plan and toward a better path if necessary. Every athlete’s training plan will require constant re-evaluation and adjustment. We not only offer customized baseball training programs, but we also offer continuing support. I am thrilled to be a part or the Baseball Ranch Durathro Training System®. It’s our online continuity program that contains a treasure trove of over 60 videos and tutorials on every aspect of our process. Members of our Durathro® system receive unlimited email access to our coaches, a monthly video analysis, a monthly coaching call and updated throwing plan, a monthly instructional webinar, a weekly mindset-inspiring email, and a tip of the week. Players engaged in the Durathro® program get better, because we constantly monitor and adjust their training plan to meet their ever-evolving needs. And when you attend one of our Elite Performer’s Boot Camps, in addition to 16 hours of world class assessment, education and training, you’ll get a30-day membership to Durathro® totally free! It will turn 2-day baseball training camps into 32-day camps at no additional charge. 32 days of training … that will be the perfect start for you to add velo, improve your command and eliminate your arm pain forever. Keep killing the process you learn at the camp and in the following month, and before long you’ll be the nastiest pitcher in town… trust me when I say, you’ll be very popular! All the girls will think you’re THE DUDE!